Jokern wrote: Even is this is the end of Time (part 1) it is not the end of the OTT! This gives us (heretic) time to study Time even more! Finish the OTVO? Rule out the few other dates in the milllena surrounding 13000s? Solving beanietalk? Finding out where they are now? In other words, there's plenty to do! And let's not forget us poor blitzers left in the dust, hoping to ketchup one day. . . .
cellocgw wrote: What I find sad is that I could be walking by other OTTers in the future and never know we'd crossed paths (unless we all decide to wear hats reading "Molpy Up" forever ). We met here for no clear reason, and had a great time. Off we go. This is the main reason I want to connect on facebook with everyone I can. That way I can recognize you all if we ever cross paths again. That and I can't wait to see what the feeds of such a great group of interesting and intelligent people contain. Link to the new OTT fb group. pelrigg wrote: It is going kind of slow today isn't. It's a weekend. The OTT is always slower on weekends. Thank you, Randall, for a delightful story told in a way that may have never been done before. Similarities abound - ever hear of soap operas? - but once an hour for a third of a year? That's cool. I also think it is cool that Randall knew his audience well enough to know that somebody (or, in our case, some troika) of his audience would archive the images right from the start. We even caught the shooting star! This exercise would have been almost pointless were it not for this audience. Last edited by sford on Sat Jul 27, 2013 5:36 pm UTC, edited 1 time in total. Changed. I'm sure no one will like this one either, but more than anything, I was trying to be helpful. There will be no cake for Minim, when she arrives, no one will welcome her. Is that what you want? They won't get the consolation we've been getting. No shoulder for them o cry on. Whatever. I guess it's just a stupid webcomic. I was deluding myself into thinking I was more. That this was more. edo, dear edo, don't feel that way. It's because it's not just a webcomic that people have, and always had, strong feelings about it. I'll still be here for the blitzers when they get to the present! And I hope you will too! I'll definitely still be here for the blitzers. With cupcakes and everything. Indeed not. I had planned on having a very awesomeful weekend in the Outside, but so far I've just been staring at my computer screen trying to fill a giant empty hole in my chest. That might sound dramatic anywhere else on the internet, but I know you guys are with me. Toomanyfeels.jpg I just still can't believe we don't have Cuegan to follow around and anticipate anymore. mscha wrote: Oldpixbot, you say? Yes, I thought of that too, but I don't way to just set that up by myself. If we, as a group, decide we need a rerun of Time, I can set up a page that updates oldpixly, and an oldpixbot that posts the oldONG 10 minutes after oldONGtime if it hasn't been posted yet. BlitzGirl wrote: Chronos is still rebooting, I see. Here's my twitter account, (real name attached if you're weirded out by that sort of thing). I guess I was ninja'd by Valarya's re-posting of what mscha said earlier. ( I kinda remember him saying that, too.) However, this is sorta different, in a way, since the current suggestion is random posts, not just repeating the OTC in order. Last edited by pelrigg on Sat Jul 27, 2013 5:43 pm UTC, edited 1 time in total. From 306. I may be suffering from nostalgia already- I just chose a page at random. But, considering the events of the last few newpics, I figured that the post deserved a "called it" recognition. Sciscitor wrote: The end happened during my ketchup and I went to coma about one newpix to early to see it. Thought that there has something happened when I molpied up and had 25 newpages! I didn't post quite as much as I wanted to and also did not have the time to work on some of my projects, but - as a thank you to all - I've updated my avatars treemap and will be publishing a new Constellation of Time hopefully very soon (current up to The End). We're there, we're there, we're in the picture!!! Kermit (the dog) says thank you! Qalyar wrote: Regarding UKL, I agree that The Left Hand of Darkness is an important work, and it is definitely something that should be on the reading list of anyone with a passing interest in speculative fiction. Or feminism. Or, frankly, books. On the other hand, I've always struggled quite a bit with The Dispossessed. But my favorite of her works is a short story, even though I don't usually like short stories. "The Ones Who Walk Away from Omelas" -- if you haven't read it, take the Time and do so. I agree abut UKL--a wonderful writer. With that touch of melancholy. But, even though I enjoy "The Ones Who Walk Away from Omelas," I often think of it when we have a certain meal, and I remember "The Ones Who Walk Away from Omelets" . . .
BTW, am I Pope for a page? Do we still have them? A Blitzer Pope--is that heresy, like an Anti-pope? That's it, exactly. Our fault for getting so caught up we weren't paying attention. No, GLR's fault for writing such a gripping tale that we completely lost track of where we were. No, not a fault at all. It's right, and it does leave room for a sequel. I don't really expect that he'll use this format again, but I suspect we'll learn more Beanish somehow. I said early on that I'm glad I was here for it when it happened, and that's still true. Others here are smarter or more creative. (Some of you are both.) I spent all of Time in the present. I think the longest time I was away was when my internet went down for 11+ hours. That was the only morning I missed ketching up, and I never was behind at the end of a day. I'm not sure what that says about me, but it speaks volumes about the OTT and the OTC. I do have an OTTification I was working on. It isn't much, I thought I'd have more Time. Molpy, Molpy, Molpy! Pixelated Molpy! Early in the morning we search each frame for thee. Pixelated molpy, we search each frame for thee. If a single pixel change the molpy we will see. Searching each and every frame your pixel change to see. Hiding in the pixel grass or in the pixel tree. cellocgw wrote: What I find sad is that I could be walking by other OTTers in the future and never know we'd crossed paths (unless we all decide to wear hats reading "Molpy Up" forever ). We met here for no clear reason, and had a great time. Off we go. ? Clearly, we could do something like that, Blitzgirl has the art skills, as do others, so we could create our own version and not be infringing, but I'd really like it if Randall would put it in his store, with his art. Nope, not forgetting you. We'll be here. Post your progress now and again. charlie_grumbles wrote: No facebook for me. Sorry, but I can't trust their policies, nor that they will not be made worse over time. I object to having my information commercialized. It is what I have emboldened that is most dangerous. Sneaky, gradual changes. Our only hope is safety in numbers and in obscurity - I don't care if they sell my facebook information, because it's all useless. That said, I'll be sticking to anonymity for the time being. I like this idea, because I miss seeing the ONGs sprinkled through the most recent newpages. One concern might be, though, that the people posting "random" newpix might have a tendency to favor certain frames (close-up on trebuchet, LaPetite's return, etc.). Perhaps if we had a list like mscha's to pick our rONGs from, and when a new rONG was posted on the OTT that newpix would be marked as "already posted" on the list? ...But that might be too complicated. Could be I'm just overthinking this waaaay too much. I think hourly might be a bit much. While there is plenty for us to be staying for, there's significantly less than before and an hourly rONG would become more than a "sprinkling"
BlitzGirl wrote: And nope, not heresy - we've had blitzer and ketchup popes before. Still condimenting. Didn't expect it to be this 1ish. FIRST POST THROW FORWARD! Welcome fireball... and what an awesomeful first post. Been lurking the OTT a long time....never managed to blitz, but often doing ketchup for several pages at a time. Very much enjoyed reading all the commentary and analysis....what a great community you all have wrought. I was just thinking....what if GLR designed the final panel to be similar to Externalities [link denied], where the water level was tied to the number of NP in the OTT. That way, as the posts continue to roll in, our raft would continue to rise? Oh, as I was registering this account, one of my captcha words was "benease"....and I was thinking "Beanese? Wow, that entered the mainstream quick..."
@Tatiana - very clever OTTification! we don't get poetry filks very often. @Sciscitor- ! Thanks for all the new data. This needle-pulled thing is definitely bigger than it looked. @Zooman - thanks for submitting a VO for some of the Cueganites! Latent, yappo or I will make sure it gets added to the dropbox for the overall project. Good point. Maybe we could slow rONGbot (or whatever) waaaay down and have a Newpix-of-the-Dip? On the t-shirt front: don't forget BlitzGirl's "OTT puts out Flame Wars" shield. And one for the Knights too. I have to go off for some real world stuff, but I wanted to add a quick couple of comments. I like the idea of coloring the frames, I would take a crack at one myself. I like the idea of an annotated book, but it would be a LOT of work for someone. As far as the whole facebook, twitter, email, steam thing. Do you think, before it's too late and people start wandering off, we could maybe have a place on the wiki or something where we could maintain a list of the information people were inclined to share to stay in touch? It's really hard to sift back through the way new pages are still coming pretty fast and find all the people sharing their facebook links, or sharing their emails, or sharing their twitter, or steam. It would be nice to have one location we could go to get all of that as people choose to share it or not. Lastly...hmmmm, France...Chateau D'if...in the fall...might be tempting even to some of us overseas. Nice selection for the first Flashback. Yeah, we're still trying to understand the OTC. And we don't want to go back to being anonymous lurkers. Nice suggestion for the format, too. Make sure it's labeled with a frame number someplace and has a clear rONG title. 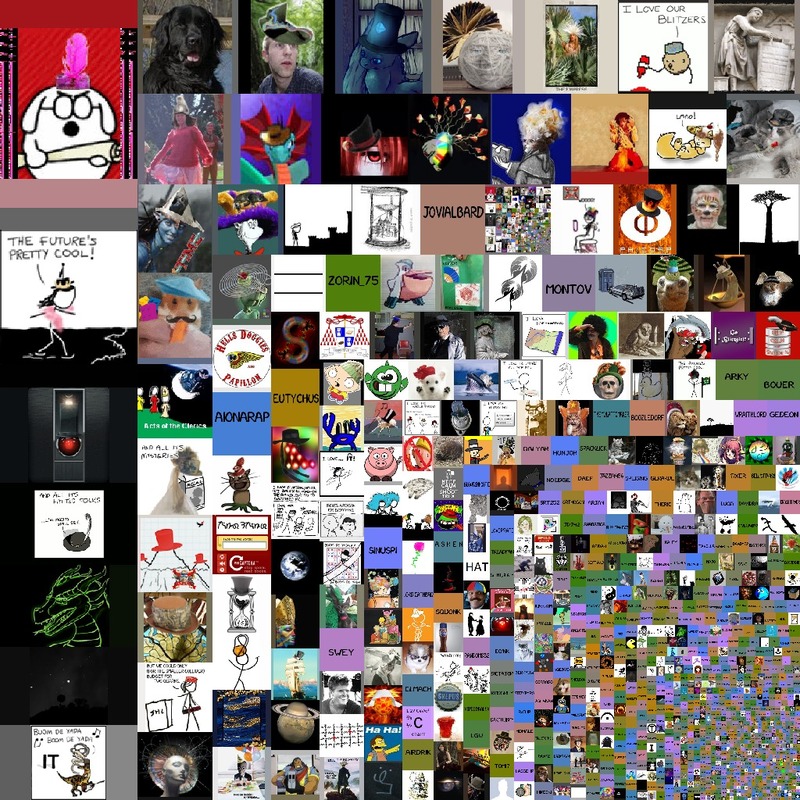 Timewaiters, OTTers, Loopists, popes, blitzers, everyone, it has been an honor and a privilege. kepstin wrote: So, I made my first post here just a little while ago; I've gotten a little over 100 pages into a blitz, and I've been in a coma for the last little while. And now this. Its only been about a week for me, and I still feel like I was a part of something awesome. I still plan to finish my blitz, maybe by the time I'm through there will be something new. Did the molpy on the right go away? Or was it mustard? RagingTyrant wrote: Is it too late to de-lurk? Thank you all for the insight (the year was 13000!?!?!) and the entertainment, even if I was just a lurker. kaiken1987 wrote: I'm not ready to give up yet! 3097 newpix that has to mean something! Right? That's C19 in hexadecimal. Does C19 mean anything? The Boeing C19? Maybe a section of Map Grid? 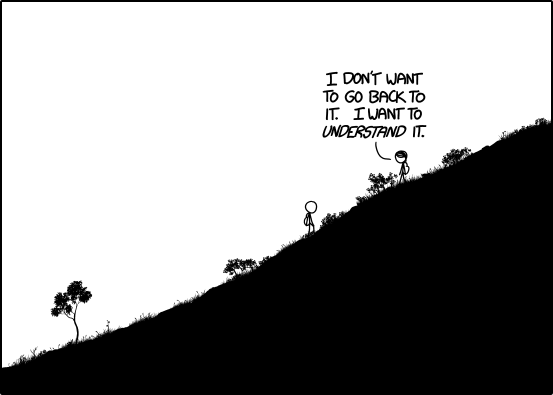 I've only posted one insignificant post before, and yet now feel my xkcd forum career is over . . . . . I really want to find out what happened to Lucky. I hope he was high enough that he made it out alive as the waters rose. I'm still looking at his body language on the attack frames, plus the fact that he went for the pack and not the tender stick-figure flesh underneath, and thinking he just wanted to be friends. Then Megan thwapped him with a stick would would definitely scare him into lashing out. Perhaps I have an inordinate fondness for meowlpies, but I'd like to think the whole Lucky episode was just a misunderstanding. I'm afraid our pricklymolp friend is for Davy Jones' locker, though. Megan needs to return the maps she borrowed, and we very much need more beanish text to help us decipher it. No fair posting an incomplete puzzle and forcing us to leave it unfinished! It seems likely that the sea has yet to reach its new level, what with the various filling rates of the several basins that make up the totality of the Mediterranean. Will a further sea rise catch the Cueganites unprepared? Will the castleraft drift away since they don't seem to have tied it up or left anyone on board to watch it? These are the reasons the ending seemed abrupt to me, and why we should eventually have more. If the GLR doesn't supply them then I suppose we need fanfic to fill these gaps. What say ye, oh creative geniuses of the OTT? SBN wrote: I do have an OTTification I was working on. It isn't much, I thought I'd have more Time. About shirts, the GLR should probably just sell a set of 3094 of 'em. There'd be plenty of people (yes, including me) who wouldn't be able to resist. Well, I'm 20 NP back and posting blind, but I have to go to work in an hour and I couldn't wait. BlitzGirl wrote: Good point. Maybe we could slow rONGbot (or whatever) waaaay down and have a Newpix-of-the-Dip? 8 yips of newpix sounds wowterful! pelrigg wrote: Nice suggestion for the format, too. Make sure it's labeled with a frame number someplace and has a clear rONG title. Mscha's viewer is good for that: It has a link to the proper code for posting with an imbedded link to the frame on the viewer... makes it real easy. If you're using one of the other viewers, just jump over to mscha's at the same number and find the one you want -- it'll be within a few. Hello, Laser Plumb! Thanks for joining us! And for not saying goodbye! Just type g before the number for geekwagon, a for aubronwood, and you will go straight to that newpix. Edits for being silly with edits. Last edited by BlitzGirl on Sat Jul 27, 2013 6:23 pm UTC, edited 2 times in total. BlitzGirl wrote: Thanks for the compliments on the Lucky picture, everyone! Anyone else thinks this mit be a good idea? Is there a chance we could color/recreate All the frames? I like this idea - it's like those art installations where identical base statue/forms are handed out to a large group of artists, and then they are free to "decorate" them as they individually choose to. It might be a fun side-project, like the voice-over one we have going. Yes. That's the kind of project that explains the image I had in my head. I guess there should be a few images posted here before anyone should be asked to add some kind of automation for the process, I'll go and pick a frame now. Hmm, so many to choose from. Come to think of it, I actually don't mind if there are several versions of the same frame... I think a wiki page will be enough to start with at this point. I'll go and set one up. Amazon could change the prices of its books for each person, individually, tailored to what it would be best for them for you to read. Century21 could "build better neighborhoods" (and make more sales) by showing likeminded people properties in the same areas. The New York Times could write their articles with each paragraph (or even each sentence) in several versions, and present a customized version of the article to you, under the same URL, without your being aware of it. When your friend goes to the same article, they get different text. And of course employers could use the social graph to decide who to interview. That is the downside. Not whether somebody two countries away finds my name. As to posting old Ongs... I don't see why. The entire collection is out there. In fact, it's in here! If you upload an attachment, place it inline, preview it, right click on the image to get the URL, put that URL inside img tags, you'll put the image where you want it, and there will be a redundant attachment. If you delete the attachment (from the post), the attachment remains on xkcd, the URL remains valid, and the image inside img tags remains visible and quotable, disappears from xkcd. eta: The image itself disappeared. Now I'll try re-attaching a different squirpy (from the same trip), but not click place it inline. (It still shows up inline, but since it has a different file number, I have to change the file number in my img tag to get it to show up. It's what I did here. Let me know if this did not work. My next experiment will be to use the file URL from the attachment in this post as the attachment for another post. If that works, then the "redundant spoilers" can all be stuffed in one massive archive post, and need not appear as redundancies in the actual post that uses it. Last edited by ucim on Sun Jul 28, 2013 2:52 pm UTC, edited 8 times in total. Hey, NetWeasel, I'm on NP1250 of my delayed ketchup and I just came across your "Wake Up Everybody" poster. Too kewl. I liked it. It has a good beat. Or even better, to see Geekwagon frame 2903 or Aubron frame 2906 in my viewer, use http://xkcd.mscha.org/viewer/gw2903 (or http://xkcd.mscha.org/viewer/G2903) and http://xkcd.mscha.org/viewer/ba2906 (or http://xkcd.mscha.org/viewer/A2906). Heh, I ninja'd mscha on his own viewer. Do I win a prize?